The Queen has now left Ireland. There's no denying that this was a big moment in British-Irish relations, which have been less than ideal for a long time. It's a big news story, possibly the biggest coming out of Europe these past few days. 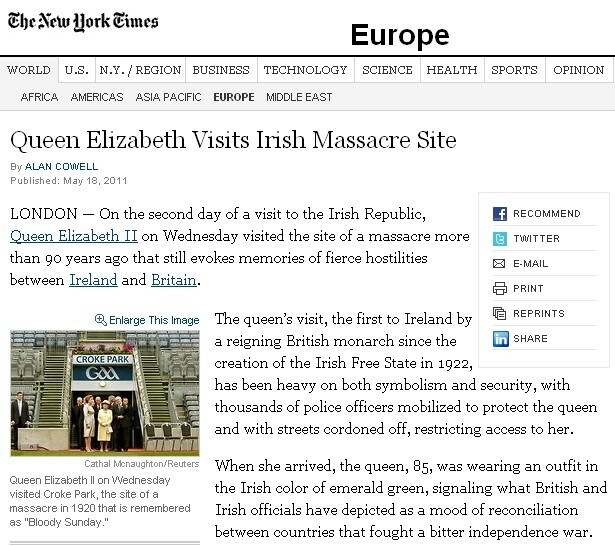 Britain's Queen in Ireland where she has never been despite the short distance between Britain and Ireland. History said 'No' to such a visit until now. It wasn't just the Queen who was here either. Prime Minister David Cameron was here for a while and his Foreign Minister William Hague was here for the duration of the Queen's visit. This was a big occasion in the history of both countries. I know that Cowell can watch events on television and do his reporting from a London office, but that's not really reporting. I mean, that's not really much different than blogging. It really seems like the Times missed a news story, only passing on the bare bones of what happened this week. No interviews with people involved in the planning or execution of the trip, no quotes from people who could put the trip in a political or historical context, no 'on-the-street' views from people for and against this visit. Nothing, just a summation of what was on television. I'm not blaming Alan Cowell, for all I know the Times is short-handed in London. I know I didn't see the by-line of regular London correspondent Sarah Lyall. 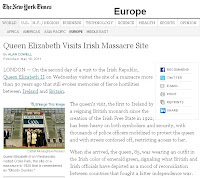 Still, I can't believe the Times couldn't find someone to report for the paper here in Ireland. The Boston Globe managed it. The Times owns the Globe, but the Globe's correspondent's 'on-the-ground' stories didn't make it into the Times. The Times, the paper of record, apparently just couldn't be bothered.